This food requires TTT (toothpaste tube technique). Finally a meatless meat that’s meat-like. The light of hope started to brighten with the words “red pepper” in the ingredients. The light further brighten when the casing was cut open releasing the smell of red pepper to go along with the red color. The texture even resembled ground meat. TJ reminds us to remove the casing before cooking. Good advice as the casing is some type of plastic. Here’s where TTT comes into play. And actually trying to squeeze the soy chorizo out of the casing doesn’t work very well. Better to cut the chorizo first into about 8 inch segments then cut the casing the long way. Fold open the cut casing and drop the chorizo out of the casing and into the pan for cooking. Discard the casing. 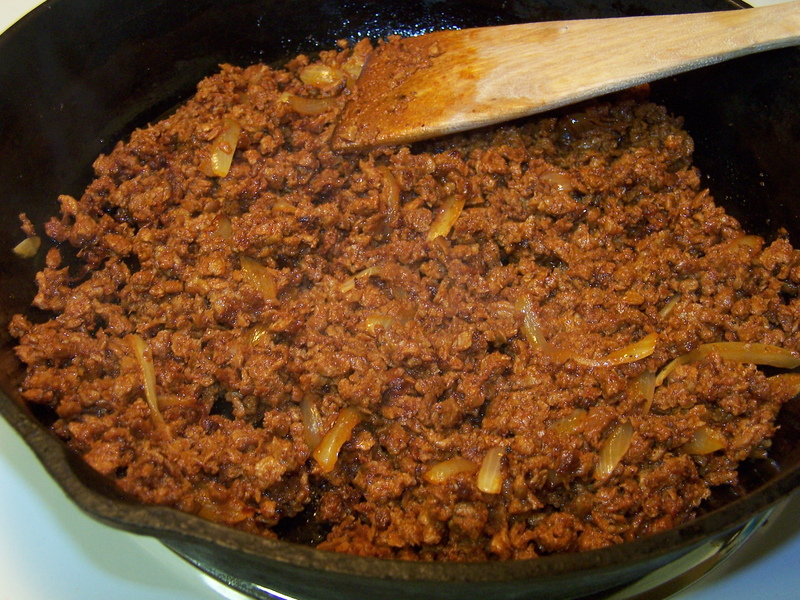 For this test I first sautéed some onions in olive oil, added a little ground black pepper and salt, then added the chorizo. The heat releases more of that red pepper smell. That’s about it for the cooking part. See the simple quesadilla recipe here for the rest of the details. The chorizo cooked up nicely. I added a little more olive oil while cooking as the chorizo was thirsty, quickly sucking up the original oil in the pan. 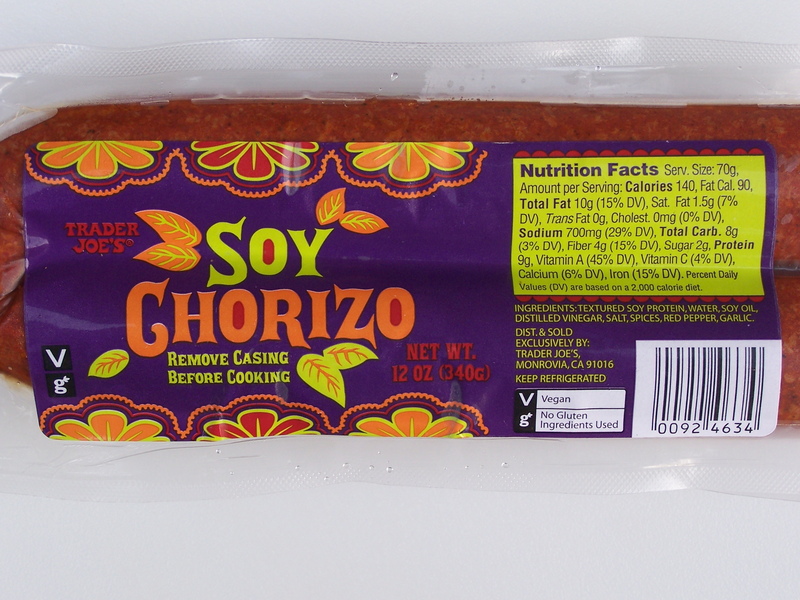 Very surprisingly, after cooking, the soy chorizo comes very close to the real thing. With an abundance of red pepper, the taste is about spot on. Even the texture is a little chewy and tough, just like the real thing. The only thing missing is the red grease oozing out of the meat variety, dripping onto your hand or clothes. But that’s not a bad thing. You’ll have to like spicy food and heat to like this. This is no wimpy veggie burger dyed red. This is the first meat substitute I’ve had that almost duplicates a meat product. In fact, I’ll go so far as to say that most people wouldn’t know the difference, especially when used with other ingredients such as in our quesadilla recipe. I’ll be looking closer in Trader’s refrigerated meat department to see if there are similar products as this. At $1.99 for 12 ounces, or $2.65 per pound, this is priced about the same as inexpensive ground beef or ground pork. There’s no price premium for being vegan. In reality since this is a soy bean product that first didn’t have to produce an animal before reaching the market shelves, I don’t know why it’s not 10 pounds for $2.65? But that’s a different complaint. TJ labels this product as both “Vegan” and “No gluten ingredients used”. This entry was posted on 08/14/2011 at 18:58 and is filed under Recipes, food, cooking and related items, Trader Joe's, Vegetarian. You can follow any responses to this entry through the RSS 2.0 feed. You can leave a response, or trackback from your own site. I was searching for a photo of this product since I just made my 2nd round of soft tacos using this. I agree that most people if any would know they are having something other than real meat. deeeeeeelicious!